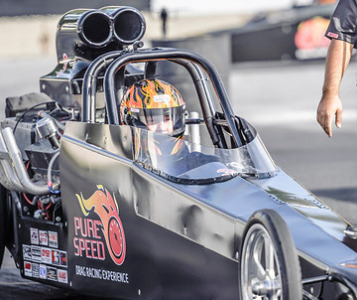 If you’ve ever wanted to drive a dragster, now’s your chance to experience that unbelievable adrenaline rush, at approximately 130mph in a 10 second ¼ mile! After safety instruction, track orientation and demo run, you will get suited up & belted into this high horse-powered dragster. Each run includes an electrifying burn-out and a heart-pounding launch off the starting line that will have you gripping the butterfly wheel with white knuckles!! All runs are done incrementally with your first pass going to the 330ft mark, the second to the 1/8 mile and your third and/or fourth covering the full ¼ mile!! We hope you are ready for this thrilling adventure!!! Experience the Thrill of Driving a Dragster! Drive our Dragster for 2-Runs down the strip at over 100 mph. The Dragster Experience can accommodate everything from a single student to large corporate groups. Ever Wanted to Drive a Dragster? Drive our Dragster for 3-Runs down the strip going faster and a longer distance each run, hitting speeds up to 130 mph. The Ultimate Dragster Driving Experience! Drive our Dragster for 4-Runs down the strip and experience two adrenaline filled full 1/4 mile passes, reaching speeds up to 130mph!